Former governor of Alaska and vice-presidential candidate Sarah Palin makes an emphatic case for the true meaning of Christmas in "Good Tidings and Great Joy." Here's an excerpt. It was a perfectly crisp December 25, 1978, and we’d already opened our presents, devoured an early turkey dinner, and gulped our hot chocolate. Dad and Mom were cleaning up the wonderful Christmas clutter off our living rooms green shag carpet. “Go enjoy the sun,” Mom said, in the way only an Alaska mother would. It was probably in the low teens temperature-wise; the sun had come out of its hiding but was already aiming to dip below the horizon. During those long, dark winters, the days are so brief they’re too easy to miss entirely, because the sun rises and sets within about five hours. We didn’t want Christmas day—of all days—to slip by. “Grab the wrench!” I yelled to my brother as I ran out the door. We hopped on our old snowmachine, which only responded to whacks of a wrench that would wiggle spark plugs magically enough to restart the cold engine. We wound through our town on that ancient Polaris we shared, and the frigid air bit my nose. Suddenly, my brother pulled the machine to a complete stop. “What are you doing?” I asked him, impatiently. But just then, I turned around and saw a tall, glaring state trooper. He had a badge and a gun, and a chill, unrelated to the temperature, went straight through me. “What are you kids up to?” he growled. There couldn’t have been more than a couple of troopers in our sparsely populated area, which is physically huge—our borough is about the size of the state of West Virginia—but, just our luck, we found one on Christmas morning. Rather, he found us. After a discussion wherein we convinced the officer we were really “not up to no good, he let us go. When we drove off, I was stewing. That officer didn’t have one ounce of Christmas cheer. We’ve all run into those who don’t quite seem to have the joy of the season in their hearts and minds—at the mall when there are too few parking spaces for last-minute shoppers, at the office party when someone has too much eggnog, at home when the kids eat all the decorated chocolate peanut butter balls you wrapped for neighbors, or at the in-laws’ when the toddler finally smashes the shiny glass tree ornaments. We’ve all—at times—lost sight of the true meaning of the season. But there are many people who haven’t merely lost, misplaced, or forgotten the true meaning of Christmas, they’re trying to actively target it to destroy it. And these true Scrooges have a frightening amount of power. This modern-day Scrooge—lets call him “Joe McScrooge” for short—threatens to destroy every last bit of Christmas cheer we have left. It was too cold, the wind was too strong, and his rental car smelled vaguely of cigarette smoke. His plane had been thirty minutes late, and Joe McScrooge was angry. While he waited for his car to heat up, he turned on the satellite radio, which was thankfully already tuned to NPR. The host was interviewing a man who was helping underprivileged children overcome their religious superstition, intolerance, and bullying tendencies. He glanced at the clock: 6:35. The airport was at least twenty minutes from Benjamin Franklin Elementary School, according to his GPS, so he had no time to waste to get to his son’s Winter program. It was his first visit to this small Pennsylvania town since his ex-wife gained custody and moved almost two thousand miles away from the warm sands of New Mexico. He turned up the radio and listened to the host’s calming voice. He needed to hear some reasonable conversation before the forced sentimentality of the school program. What the heck does religion have to do with french fries? He pushed it from his mind as he drove into the center of town. Wreaths were hanging from every storefront. Christmas lights wrapped around the light poles were blinking relentlessly. Red ribbons flapped sloppily in the breeze, Joe noticed. The lights were multicolored and garish, and Joe was annoyed at their distraction. As he drove closer to the court square, however, his jaw dropped. There, right next to the courthouse—between a metal newspaper box and a ridiculously oversized menorah—was the unmistakable outline of a Nativity scene. It included the baby Jesus, the “virgin” Mary, and her gullible fiancé, Joseph. The only miracle in that story was the fact that Joseph apparently fell for Mary’s story of a divine insemination. The Bible’s no better than The Jerry Springer Show, Joe thought. How on earth do these people believe such drivel? He took the turn slowly, checking out the cheap plastic baby Jesus doll nestled in hay. 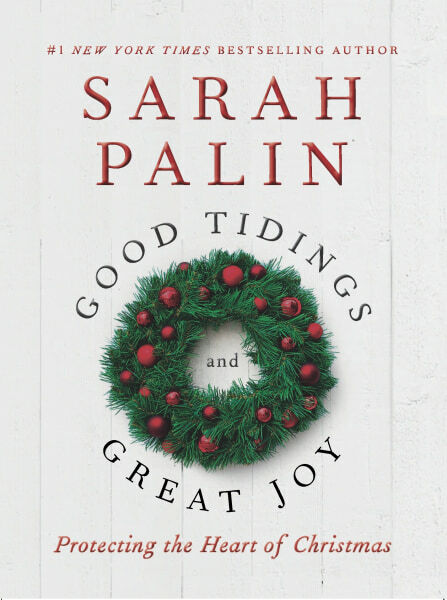 Reprinted from Good Tidings and Great Joy by Sarah Palin by arrangement with Broadside Books, an imprint of HarperCollins Publishers, Copyright © 2013 by Sarah Palin.